Many kids grow up with a dog in the house. And in most cases, it is great. Having a pet has many benefits, including teaching responsibility if your child helps take care of his daily needs. Having a dog also offers companionship and can teach social skills, such as not to be too rough when playing. Plus having a dog can be a lot of fun. One of the main downsides of allowing your children, especially younger ones, around a dog is that sometimes dogs bite. In fact, the CDC estimates that almost 5 million people a year are bitten by a dog in the United States, with as many as 800,000 people, more than half of them children, requiring medical attention for these dog bites and about a dozen people died from dog bite injuries. These dog bites are a big health problem, but one that is largely preventable. That is why it is important to help reduce your child's chances of being bitten by a dog. One of the easiest and most important things that you can do is to not leave your younger children alone around a dog, not even the family dog. Do not play aggressive games with your dog; for example, wrestling. Remain motionless when approached by an unfamiliar dog -- never run or scream. Other examples of aggressive dogs, which may have a higher attack rate, include the Bull Terrier, Cocker Spaniel, Collie, Doberman Pinscher, Great Dane, Pitbull, Rottweiler, and Siberian Husky. However, according to the American Veterinary Medical Association, 'There is no such thing as a bad breed of dog. All dogs can bite if provoked.' So instead of concentrating on the breed of dog, you should just keep your kids safe around any dog. You should seek immediate medical attention for multiple or serious bites, especially in younger children and bites that involve your child's head and neck. As with other wounds, you should stop any bleeding by putting pressure on the wound and then clean the area extensively. Keep in mind that most dog bites aren't sutured closed, because of this risk of infection. Bites on the face or those considered to be 'clean' or quickly seen by the doctor may be sutured at times. Other preventative measures that you may need to take include getting your child a tetanus shot and tetanus immune globulin if they have had less than three doses. Even if they have had three or more tetanus shots, if they have a bite that is not considered clean and minor, they may need a tetanus shot if it is been more than 5 years since their last one. Children with clean, minor bites may also need a tetanus booster if their last one was more than 10 years ago. 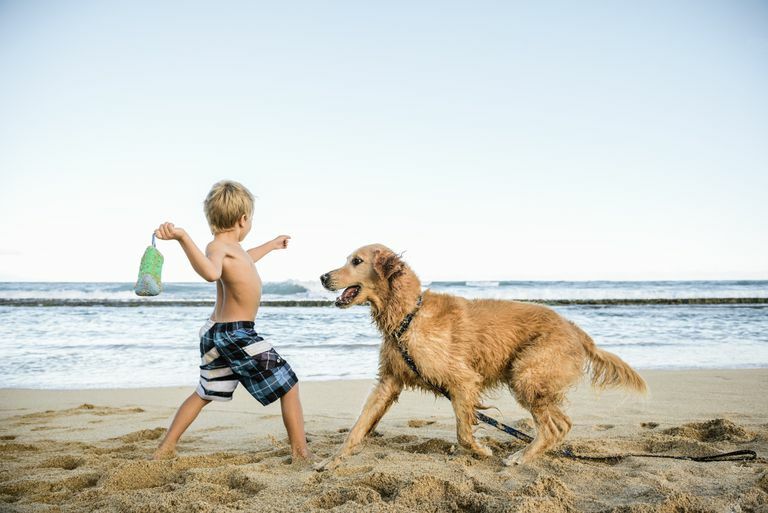 Since most kids have had 4 tetanus shots by 18 months of age and a booster at 4 and 12 years, they may not need another one after a dog bite. Since dog bites are usually puncture wounds that are contaminated with saliva, they typically won't count as a clean, minor wound. An unvaccinated or child or child who is incompletely vaccinated, with less 3 or fewer doses of a tetanus-containing vaccine (DTaP or Tdap) might need tetanus immune globulin and a tetanus shot. Fully vaccinated children might still need another tetanus shot if it has been more than 5 years since their last dose. Since most dogs in the United States are vaccinated, rabies is not usually a big concern after a dog bite. If your child is bitten by a dog and you are not sure if they have had a rabies shot, you should contact your pediatrician and your local health department and animal control department. Children may need to be treated with Rabies Immune Globulin and rabies vaccine within 48 hours of being bitten if the dog who bit them has not been vaccinated and is thought to have rabies or if the dog can not be found. If the dog was found and its rabies status was unknown, a veterinarian may need to quarantine the dog for 10 days. Schalamon, et al. Analysis of Dog Bites in Children Who Are Younger Than 17 Years. PEDIATRICS Volume 117, Number 3, March 2006. CDC. Preventing tetanus, diphtheria, and pertussis among adolescents: use of tetanus toxoid, reduced diphtheria toxoid and acellular pertussis vaccines. Recommendations of the Advisory Committee on Immunization Practices (ACIP). MMWR 2006;55(No. RR-3).